Dryers provide a heating method to dry laundry and damp or wet clothing. 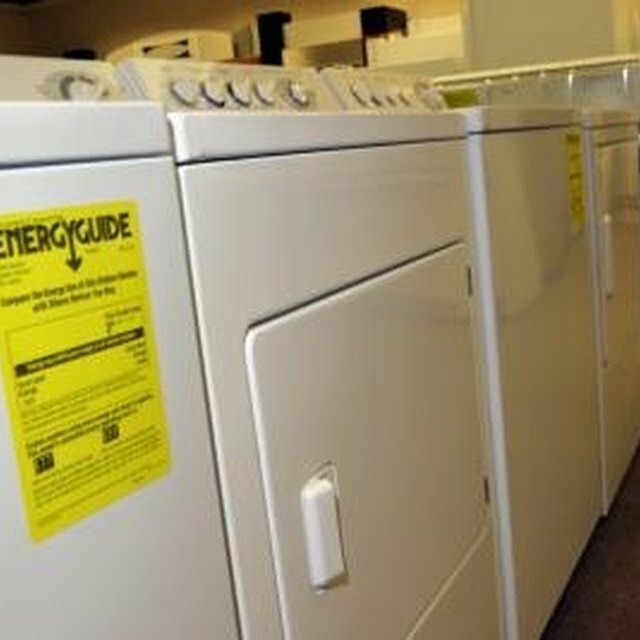 After continuous use, elements of the dryer may begin to wear and fail. A typical problem of a dryer includes one that no longer produces heat. The common culprit of this problem is a failing or defective heating element. The element can be tested using a multimeter device that is designed to diagnose electrical problems. Multimeters can be found at most hardware and home improvement stores. Unplug the dryer from the wall outlet to disengage power to the unit. Remove the front panel of the dryer. Four or more screws typically hold the panel in place. If the dryer is front loading, open the door first to access the screws. Disengage the clips that are holding the panel in place and pull away from the unit to release. Locate the heating element inside the cabinet. The heating element consists of a coil, heating piece and several metal probes. Set a multimeter device to the R x 1 resistance scale. Touch each probe of the heating element with the multimeter. If you see a reading of infinite resistance, your heating element is bad and needs to be replaced. Remove the heating element wires using needle-nose pliers. Unscrew the screws holding the heating element in place and remove. Insert the new heating element and screw into place. Strip the electrical wiring of the new heating element and attach to the dryer wires using twist-wire connectors that can be found at most hardware stores. Run the dryer for 10 minutes without any clothes to break in the new heating element.